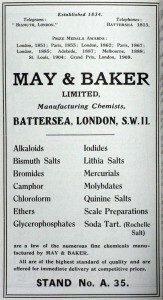 May and Baker advertisement, 1922. Image licensed under GNU Free Documentation License, Version 1.2 via Grace's Guide: The Best of British Engineering, 1750-1960s. and pharmaceutical fields since 1934. The Dagenham site was bought by May & Baker then based in Wandsworth, for £1l,000 in 1919 but was not opened for business until 1934. It was to become the headquarters of the multinational, May & Baker Group, a wholly owned subsidiary of Rhône-Poulenc S.A., and in its heyday the site employed some 4,000 people. The Dagenham site was diverse in terms of chemical manufacture with active pharmaceutical ingredients, pharmaceutical products, veterinary medicines, aromatic chemicals, agrochemicals, photographic chemicals, plastics, industrial and fine chemicals being manufactured there over the last 75 years. In addition to chemical and pharmaceutical manufacture, Dagenham had a strong R&D base and some significant molecules were synthesised here. 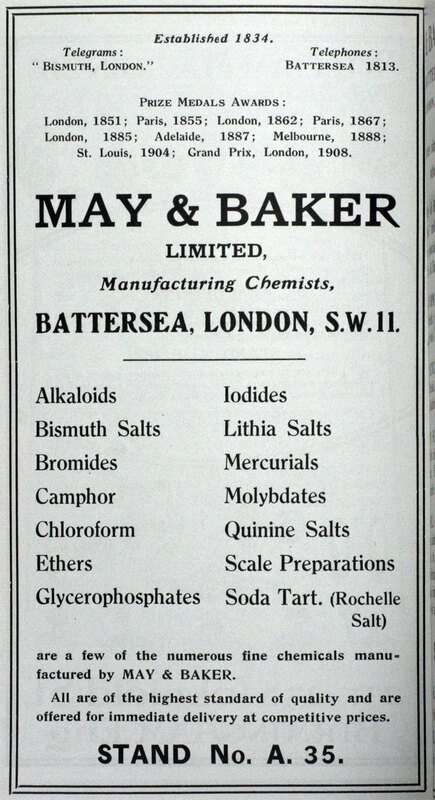 Perhaps the most notable are the bacteriostatic sulphonamides, with M&B 693, Sulphapyridine, synthesised in 1937 and M&B 760, Sulphathiazole, a year later. Both were very active against cocci infections and were the forerunner of the antibiotics. During WW2, it was noted that M&B 693 had saved many thousands of lives. Indeed Sir Winston Churchill extolled the virtues of M&B 693 having been treated with it for pneumonia infections twice during the war. Research on sulphonamides stopped after these two products but continued with other therapeutic agents and agrochemicals. Dagenham was instrumental in developing the diamidine group of bacteriostats, including Pentamidine, Propamidine and Dibromopropamidine, the beta-blocker Acebutolol hydrochloride, the HBN herbicides, Ioxynil and Bromoxynil, the phenoxybutyric acid herbicides and the carbamate herbicide, Asulam. In addition it developed and manufactured the veterinary compounds, Dimetridazole, Sulphaquinoxaline and Isometamidium chloride and marketed many improved products in the field of photographic chemicals, developers and fixers. The site has won the Queens Award for Industry three times for technological innovation and in 1974 was granted a royal warrant as suppliers of agricultural herbicides to HM Queen Elizabeth II. From its May & Baker beginnings. Dagenham has had several name changes and as the Company expanded and merged the site became consecutively Rhône-Poulenc Ltd., Rhône-Poulene Rorer, Aventis and latterly Sanofi-Aventis. However, although the sign on the gates is now Sanofi-Aventis, the site is still very much “May and Bakers” to the local community. However, in recent years many of the plant’s activities have either been has been discontinued or transferred to other Sanofi-Aventis locations. At present it is only manufacturing sterile oncology products and a couple of other anti-cancer drugs. The work force has shrunk to 450 employees and in December 2009 it was announced that the whole Dagenham operation would close by 2013. The site will be redeveloped as an industrial park and sadly an era of London’s chemical industry will become history. Original article written by Alan Dronsfield and published in V. Quirke (ed), Royal Society of Chemistry Historical Group Newsletter, August 2010. This entry was posted in England, Europe, United Kingdom and tagged chemistry, industrial, medicine, pharmaceutical, research by Alan Dronsfield. Bookmark the permalink.